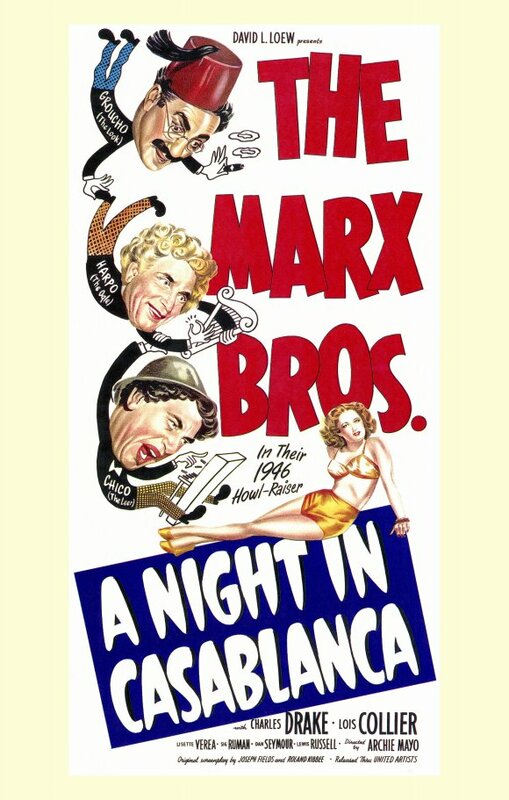 What you have here is the 12th Marx brother film. It was a later film that they did, coming out of retirement basically to help cover Chico's gambling debts. I read Chico's daughter's biography of him around the end of middle school. A long time ago, but from what I remember, he was a SUPER DUPER BAD ALCOHOLIC, and a pretty fucked up gambler, along with being an insanely gifted piano player and all around funny funny dude. So this is a send up of the film noir genre that was big around the time. 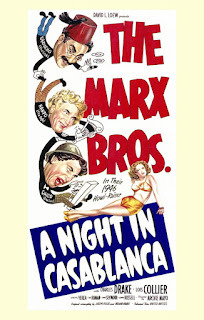 Starring Groucho, Chico, and my favorite Harpo in A NIGHT IN CASABLANCA!!! Not necessarily a bad movie per se, this is more of "the better of their later" movies, is how most critics have put it. I think its spot on. We have hilarious performances by each of the brothers, harp playing by Harpo, a piano performance from Chico, and tons of gags. The plot revolves around a hotel in Morocco that has had three managers murdered. 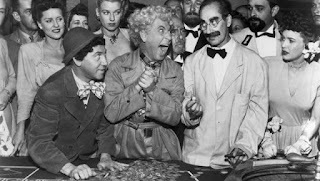 They can't find a soul that will take the job to manage the place until the run up on Ronald Kornblow (Groucho) a seasoned motel manager who thinks he's just walked into the big time. 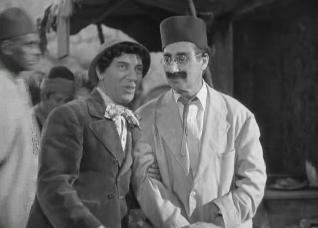 Corbaccio (Chico) is the head of the camel cab service who attaches himself to Kornblow as his bodyguard. Rusty (Harpo) is his valet who begins the movie working for the main bad guy but soon realizes he's in hot water if he hangs with that dude for too long. The reason the managers are getting murdered is because the main bad guy is a Nazi war criminal posing as a Count in hopes of recovering his stolen treasures he's hidden in the hotel. So the Count keeps sending chicks to woo Kornblow but Kornblow is as stubborn and slippery as he is inept. He manages along with the help of Rusty and Corbaccio in dodging the bullet so to speak, and succeeds in making the Count begin to think that he's lost his own marbles. 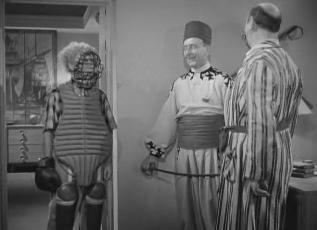 The Count tries to turn it around on Kornblow by convincing the cops that since he's always seen in the company of Rusty- who's just broken the bank of the casino by betting red 22 or 35 like 3 times in a row on the roulette, and winning- that they must be in on it with each other and cheating the house. So they have to convince the cops that the Count is a crook before the cops can get them. The straight man and that guy's main love interest who are also trying to catch the Count help the brothers chase them to the airport for the final scene mimicking the final airport scene in CASABLANCA. 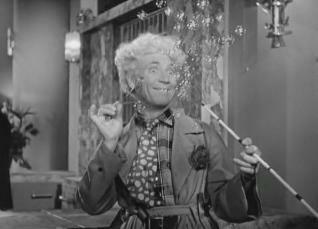 There's a super awesome sequence where Harpo is flying the plane and finally they crash into the police station exposing the Count to be Stubel the Nazi. I think watching this airport scene that the budget for this flick must have been huge for the time. Should you watch this? Well, of course I'm going to tell you to, I love the Marx brothers. Even though its not their best flick, it is loaded with laughs. Check it out on Netflix instant now.